The annual meeting of the Society for Scholarly Publishing is happening right now — May 30th till June 1, in Arlington, Virginia. Please keep it decent and above the belt. A good question gives plenty for the panel and the audience to chew on. We have about 90 minutes, so hopefully we’ll be able to get through a broad spectrum of debating points on the value of publishing organisations as part of the scholarly ecosystem and hopefully some of broader points about an industry in flux from the impact of the digital age. What makes publishers think they have a say in what contract funders and researchers make between themselves? If publishers are to have a say on how grant money is spent, shouldn’t laboratory equipment manufacturers have a say, too? 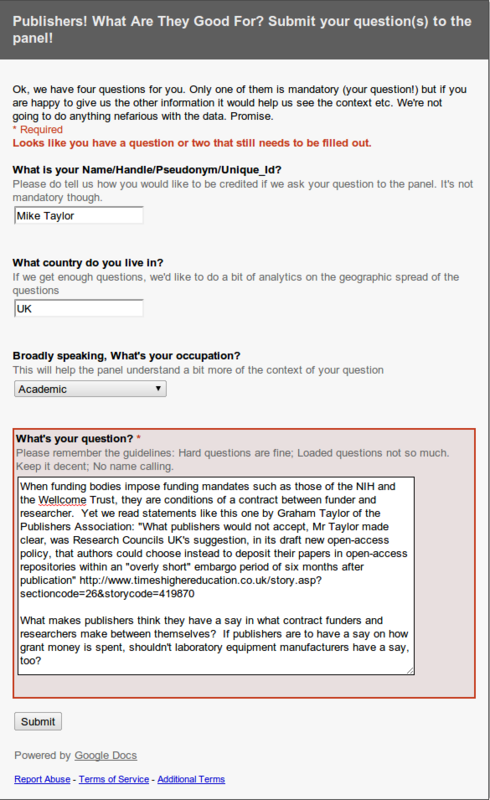 For anyone who’s been following my contributions to the ongoing scholarly publishing discussion, this won’t be a new question: I posed it in rather more confrontational terms on this very blog, in See, this is why publishers irritate me so much, and then included it in a milder form in my most recent Guardian article. But to the best of my knowledge, no-one in publishing has offered an explanation yet. So that’s why I was keen to get it in front of the panel. I really hope they don’t dodge the question. If anyone who reads this is fortunate enough to be at the SSP panel, maybe they could report back on what treatment this question gets? I’ll be at the panel, and I’m happy to report back afterwards :) Ping me if I haven’t done so tomorrow afternoon. Thanks, Jason. Maybe even you could tactfully remind them of the question of they accidentally overlook it. I’m guessing the reply will either be that Graham Taylor isn’t here and we can’t speak for him or that there will be some clarification of nuance, something like “would not accept” means “won’t publish under those terms”. Publishers obviously can choose to publish or not publish given any particular set of terms. They can accept the terms or not accept them, that is presumably what “What publishers would not accept” means. I’m guessing the reply will be … something like “would not accept” means “won’t publish under those terms”. I’d be happy with that interpretation: it would indicate publishers making a decision on the basis of the rules the funders impose, rather than trying to dictate what terms the funders may impose. Totally glad to take responsibility for that; was in my mind to bring up the question, discussed it with panelists immediately before, and then….forgot. OK, Jason, thanks for reporting back — albeit with bad news. It would be good if there was some kind of write-up of hat did get discussed and what was said. Do you know of one?